The PQSCADA (Power Quality Management Software Suite), empowers the BLACKBOX device series with an unparalleled data recording capability providing the most accurate detection and isolation of all PQ anomalies for the diagnosis & effective maintenance of equipment. Zoom in from a year’s worth of continuously recorded data to less than a millisecond in order to identify power quality details for over 10,000 parameters. Simplify troubleshooting with full management & control over time synchronized data from any number of BLACKBOX devices, within a particular site or across many sites. The PQSCADA & associated Investigator Software Applications offer a wide range of options & adaptations for configuration making it extremely versatile to meet the needs & requirements of individual users. 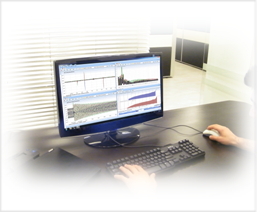 Identify, monitor & analyze the finest PQ Data detail, from trends, Volts, Amps, Hz, events, harmonics, THD, flicker, power, energy, statistics etc. With the PQZIP Upload Manager, all PQ Data is rapidly uploaded & retrieved in PQZIP compressed file format to any remote server in a manageable database storage. The PQSCADA is equipped with an integrated security module for full IT security management from the administrator, operator to the viewer of PQ data.